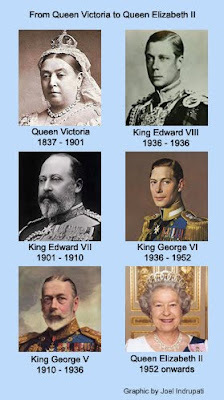 For centuries now, succession to the British throne has always been to the first male, born to the ruler, unless there is no male offspring; like in the case of two daughters, Princesses Elizabeth and Margaret, born to King George VI. His death in 1952 automatically made the eldest daughter as Queen Elizabeth II who is currently reigning. Her husband Prince Philip is, however, her consort and can never be called King Philip. Until her ascension, interestingly, she was always regarded as a ‘heir presumptive’, unlike her own first born son Prince Charles who was, and still is, the ‘heir apparent’ from the time he was born. She was called a presumptive heir because her father George VI before his death was still capable of producing a male offspring who could have ascended to the throne, even if he was many years younger than his sisters. And the King’s wife, of course, is always called a Queen unlike the other way round. So, understanding British Monarchy could be a bit tricky. But now, in a surprising but welcome move, the British government has begun the process of reviewing the ancient, discriminatory rules of royal succession, so that if Prince William and Kate Middleton, who are getting married today, have a baby girl as their first child she would eventually become queen; even if a male succeeds this female child. However, amending the succession law would require agreement and similar legal overhauls in the 15 Commonwealth countries where the British monarch is the head of state, such as Australia, Canada and New Zealand. Many are hoping the matter will be resolved before Kate Middleton begins producing children to avoid a confusing line of succession. In the last two centuries, the succession of British rulers from Queen Victoria to Queen Elizabeth II makes up a very interesting study. Queen Victoria’s rule (1837-1901) was over an extremely vast British empire, which at that time had large parts of Africa, India, Japan, China, and some Atlantic and Pacific islands, within it. Queen Victoria's first child was a daughter — also called Victoria — but it was her younger brother who succeeded to the throne, as King Edward VII. This was the queen who faced the first war of Indian Independence from her Indian colonies, and appointed viceroys with military power instead of the East India Company which had held military power till then. King Edward VII’s reign (1901 – 1910) was for about nine years. He had married Princess Alexandra of Denmark. Their first son Prince Albert unfortunately died before the death of Edward VII. So the second son ascended to the throne as King George V. He had also married the fiancé of his elder brother, Princess Mary of Teck. King George V’s rule (1910 – 1936) had seen much turbulence as the First World War was quickly followed by industrial unrest in UK. It was in commemoration of the visit of King George V and Queen Mary that the ‘Gateway of India’ was built in Mumbai. So, that he and his queen would enter their Indian territory to meet their Indian subjects. His first son who became King Edward VIII caused a major storm in the monarchy’s succession law. King Edward VIII’s rule (Jan 1936 – Dec 1936) of 11 months was the shortest in centuries of British monarchy. He caused a constitutional crisis, before his formal ascension to the throne, by proposing marriage to the American socialite Wallis Simpson, who had divorced her first husband and was seeking a divorce from her second. The prime ministers of the United Kingdom and the Dominions opposed the marriage, arguing that the people would never accept a divorced woman with two living ex-husbands as queen. This would also conflict with his status as head of the Church of England, which opposed the remarriage of divorced people if their ex-spouse was still alive. Amidst the huge crisis, he chose to abdicate rather than give up Mrs Simpson. And his younger brother became the king, as George VI. King George VI’s rule (1936-1952) began unexpectedly because as the second son of George V, he was always under the shadow of his elder brother, Edward, who was the heir apparent, groomed to inherit the throne, and who no one expected would abdicate. King George VI was not very strong, and had a voice impediment (made more famous by the recent Oscar winning movie on his life, The King’s Speech). But George VI took over from King Edward VIII and reigned well despite a Second World War during his term. King George VI’s marriage to Queen Elizabeth the Queen Mother resulted in two daughters, Princesses Elizabeth and Margaret. Queen Elizabeth II’s rule (1952 onwards) began instantly with the death of her father King George VI when she was away from UK. With husband Prince Philip, she went to Kenya as ‘Princess Elizabeth’ but had to return to UK as ‘Queen Elizabeth II.’ She was 26 then. She was received at the airport by her then Prime Minister Winston Churchill along with Clement Atlee and Lord Mountbatten. Prince Philip, her consort, stayed back in the plane for a while to allow time for the new queen to emerge and meet the dignitaries and her new subjects. Since then, she has seen almost six decades of amazing changes in the world. And she and Prince Philip have four children, Prince Charles, Princess Anne, Prince Andrew and Prince Edward. Prince Charles, the Prince of Wales is heir apparent to the British throne; and second in line to the throne is his eldest son Prince William, from his first wife the late Princess Diana. Now, with his son’s marriage to Kate Middleton, all of UK and dominions of the commonwealth are eager to know if in case, the first child born to this couple will be a girl, will she be the future queen? That, only time will tell. But for now, all eyes are on the marriage of a man who would be king.